If you liked yesterday's Mermaid, maybe you'll like today's, too. I know I do. 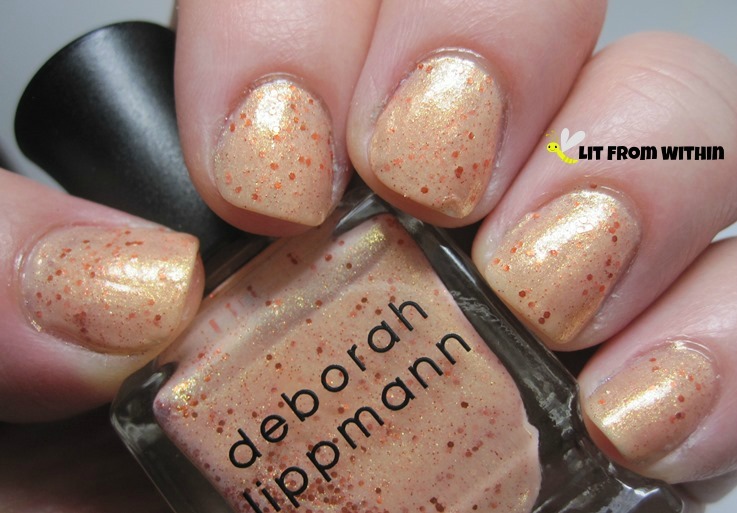 Deborah Lippmann does it again with Million Dollar Mermaid, a pale orange polish with darker orange glitter and a gold shimmer. I decided to play with Deborah Lippmann Hit Me With Your Best Shot, the Pat Benetar-inspired metallic grey polish. I love playing with textures, and there's something interesting about pairing the soft, glowing Million Dollar Mermaid with the harder, edgier Hit Me With Your Best Shot. 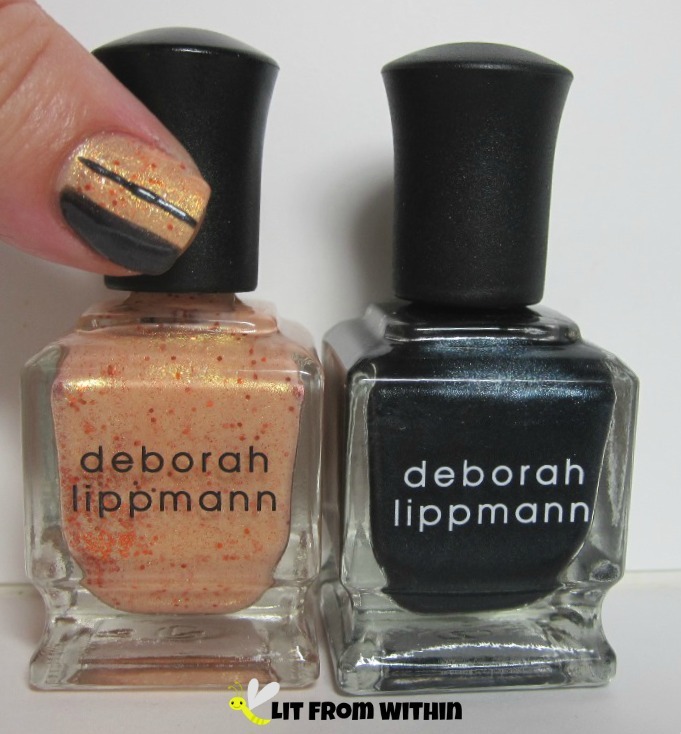 Bottle shot: Deborah Lippman Million Dollar Mermaid and Hit Me With Your Best Shot. Do you like playing with textures in your nail art? I never would have thought I'd be an orange polish fan, but they're some of my faves. It's really flattering, too - I can see it looking great on lots of different skintones. I really liked the mermaid collection as well! I have the original Mermaid (and a couple dupes!) and I wanted alllll of this collection, but it's just too hard on the wallet. Never would have thought to pair those shades together! LOL, sometimes, I just grab what just came in the mail and make it work. Or laugh at my matchmaking FAIL. I think it's the shimmer! It just takes it up a notch. I had a best friend back in the day who was a huge Pat Benetar fan, and he converted me. I have to admit, I was sold on the name, too! I hope I don't have problems with all my other pix now. My first Blogger Breakdown! Thanks, Miranda. :) Mostly, I copy others, though! Thanks! I'm sure it's been done before, I'm really not that creative! I do love using stripes to make the nail look longer and straighter, though! Thanks, Phyrra! I love stripes. Simple and clean. Why don'tcha hit me with your best shot. duh nuh nuh nuh nuh nuh nuh... I know, I know! Pat is fierce. I love the mermaid collection! The Mermaid polishes from DL are so pretty! 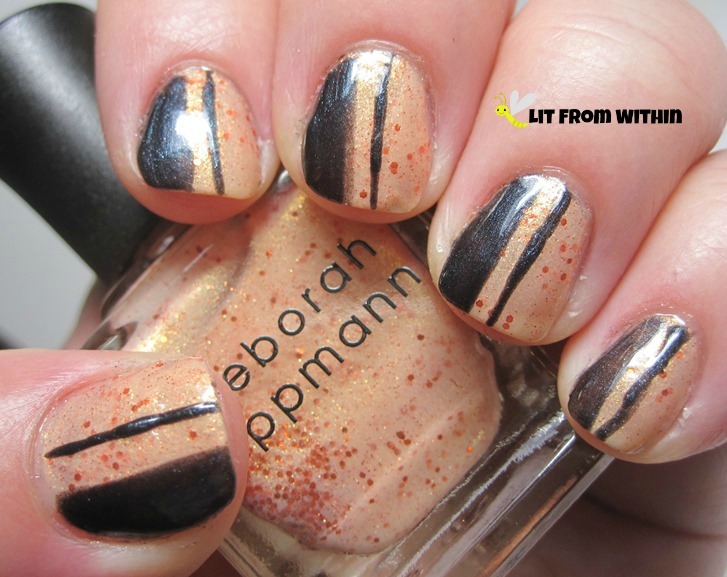 I haven't paid enough attention to Deborah Lippman, pretty polishes. You're out there, Girlie! ;P Darling polish! Way, way out there. Lol! Miss you! Hit with me your best shot, that's my top of mind song when I read your pst title. 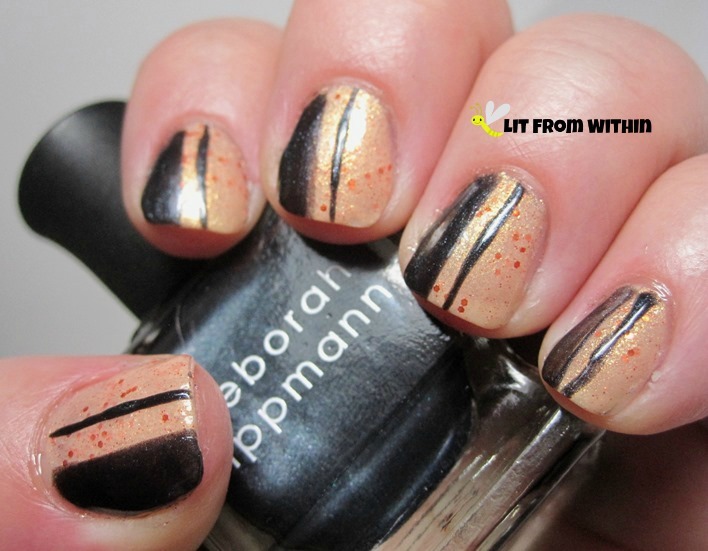 Another lovely shade from THE Deborah Lippman! Sing it, girl! Deborah makes some killer polishes, for sure! All of these mermaid colors make me want to break my no-buy. Seriously, gorgeous swatches! What a wonderful compliment! Hang in there, maybe they'll be on sale next month! I never play with textures, but I'm feeling really inspired by your posts! What an awesome compliment! I love it when people feel inspired or empowered by my posts. Thank you! Oh, hells yes!! Great mani. I'm doing it!